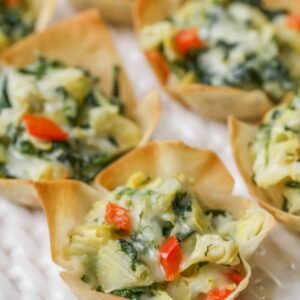 Cheesy Spinach and Artichoke Cups - this easy appetizer is full of flavor and perfect as an appetizer or side dish. Add one wonton wrapper to greased muffin pan and spray olive oil spray on top. Bake for 5 minutes. In a medium bowl, mix artichoke hearts, cheese, spinach, mayo, garlic and peppers until well combined. Spoon into wonton cups and bake 12-14 minutes. ENJOY!